Mount Rogers, Virginia state highpoint. 2014. Mount Rogers is the high point of Virginia, and is located at the western end of the state. It was my first summit in the series of peaks known as the "Southern Six-pack". These are six state high points that are all relatively close to each other, They include the high points of Virginia, North Carolina, South Carolina, Georgia, Tennessee, and Kentucky. 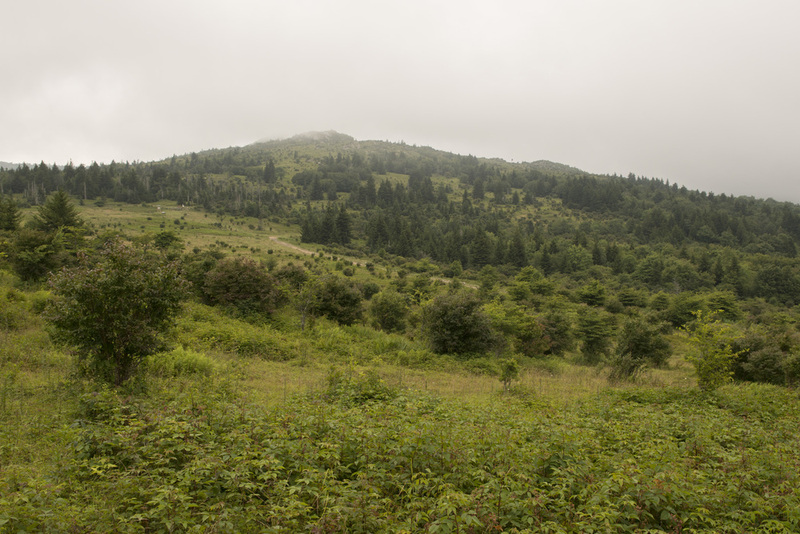 Mount Rogers is the only one of the six that requires an actual hike, with the rest being drive ups. While not a technical hike, it is a decent length, about 8 miles round-trip. A portion of the trail to the summit follows the famous Appalachian Trail. The lower sections of the trail are open, grassy pastures with large exposed outcrops of rock. As you get closer to the summit it becomes more densely wooded and less rocky. But that's all the boring academic stuff. 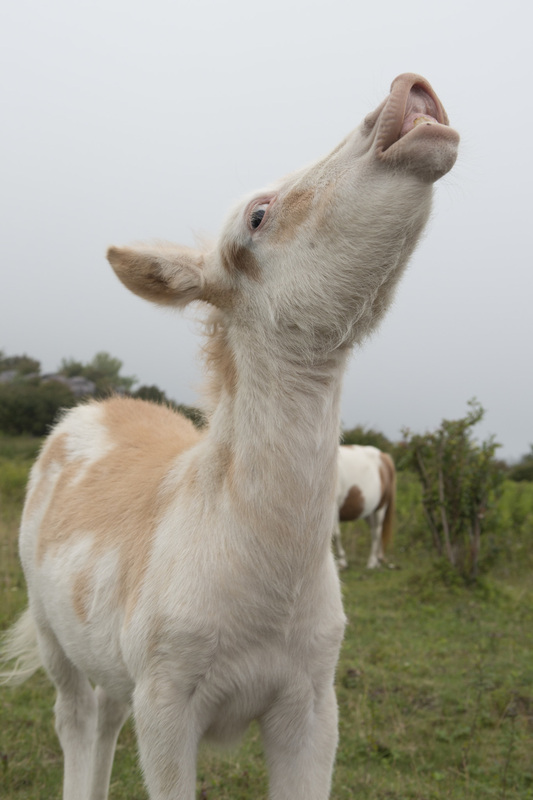 When people talk about Mount Rogers, one thing always comes up; wild ponies. 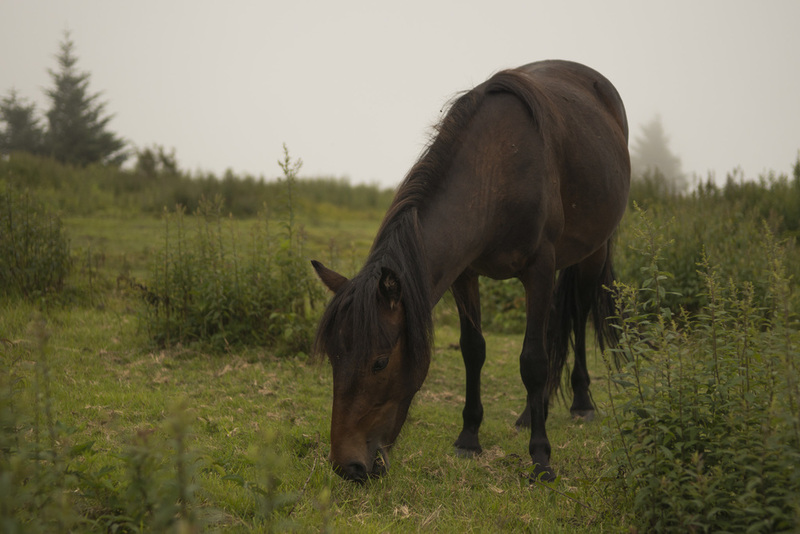 While researching this trip I read that Grayson Highlands State Park (the park you have to hike through to get to the summit) is home to over 100 wild ponies. While an exciting prospect, I tried to keep my expectations of actually seeing any of them to a minimum as it is a large park and they are free to roam anywhere within it.I recalled my visit to Isle Royal National Park, an island in Lake Superior famous for its isolated wolf and moose populations. Three days on the island and I didn't see a single wolf or moose. With Mount Rogers I would've considered myself lucky just to get a distant glimpse of the ponies. And on the hike up to the summit that's all we got; distant glimpses. Just two or three times on the way up did we see little brown specks against the sea of green in the distance. After 4 miles and a couple of hours we made it all the way to the summit without a single wild pony encounter. Not once did we cross paths with any of them. While it was a beautiful hike and I did get the summit, I was really hoping to meet some of those wild ponies. On that front, it looked like this trip was going to be a bust. As we came out of the denser woods surrounding the summit we came upon a clearing. And there they were. Wild ponies! It was a group of around five individuals, a few dozen yards off the trail. We tried to approach very slowly and quietly so as not to startle them. I wanted to see how close we could get. We got closer. And closer. And closer. They didn't really seem too shy. One in particular was very friendly. He approached us, checking us out. At one point he started trying to eat my boot. So there we were finally getting to see the storied wild ponies of Mount Rogers. After hanging out with our new furry friends for a little while they slowly started to wander off, as did we. We continued on our way down the trail excited about our encounter with the local wildlife, grateful for that one chance to see them. And then we ran into another group of them. And another. It was as if all the ponies knew they had missed us on the way up and were now making it up to us on the way down. I lost count of how many ponies we saw altogether. Several dozen at least. They were even hanging out right at the last fence before the final stretch back to the parking lot. I don't know why but they had suddenly come out in full force on the way down. And it wasn't just the ponies. We also came across a small group of cattle. One was a gigantic bull with huge horns. I was a little wary of him but he didn't seem to mind us at all. We eventually made it back to the car and continued on our way to our next stop,the tri-point of North Carolina, Tennessee, and Virginia. This would definitely go down as one of the highlights of my high pointing adventures. Check out the gallery and video below to see the beautiful Mount Rogers and it's adorable wildlife. 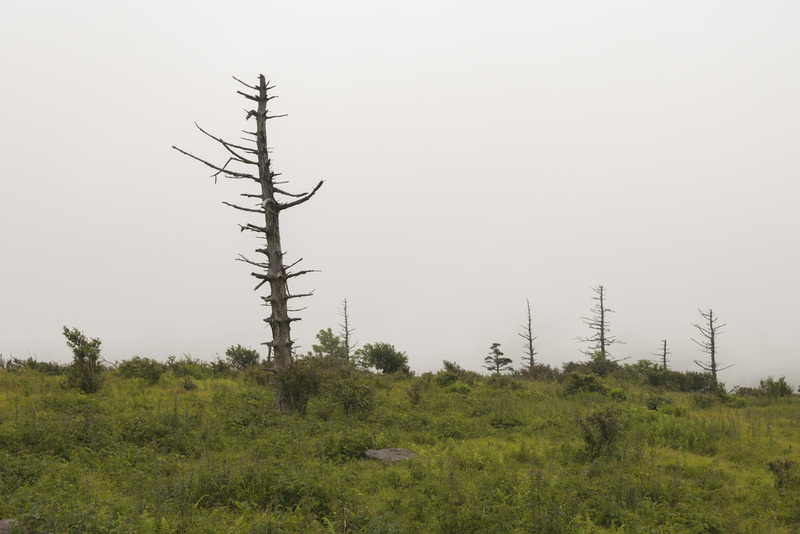 A short video of my trip to Mount Rogers, the highpoint of Virginia, from July 21, 2014. Shiri and I at the summit of Mount Rogers. Our visit to Mount Rogers was part of a week long trip of highpointing which culminated at the 2015 Highpointers convention in Gatlinburg, Tennessee. We visited five state highpoints, three tri-points, and two national parks.